It’s not often that you find a Macintosh dumped out on the side of the road. [GrandpaSquarepants] was one of the lucky individuals that did. Being the good friend that he is, he made his roomy carry the 50 lb behemoth back to their apartment. Not surprisingly, the machine didn’t boot up and ended up sitting around the apartment for a few years. Fast forward from 2012 to present day and [G.S.] decided it was time to do something with that G5. That “something” wasn’t about fixing it. Instead, it was gutted to turn it into a Macintosh-cased Hackintosh. If you’re unfamiliar with Hackintosh, it’s a term used to describe a project that gets Mac OS to run on non-Apple hardware. [G.S.] could have just crammed everything into the G5 case and called it a day but he decided to spend the time to make it look supremely presentable. 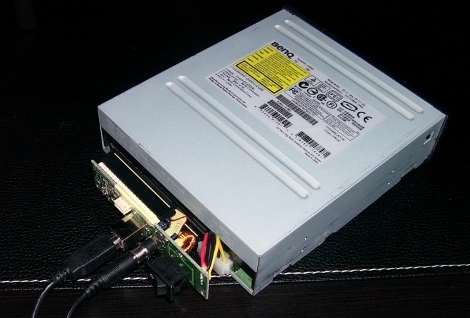 The case was significantly modified to fit the non-Apple computer components, including the addition of a custom rear panel made from aluminum to mount the power supply, cooling fan and to allow access to the motherboard connectors. Take a close look; there are two CPU coolers in there. It was such a close fit that there is only 2.6mm (.1 inch) of clearance between the cooler and the case. Two Dell U2415 monitors and an Apple wireless keyboard and mouse make up the rest of the setup. Overall, [G.S.] is happy with the final outcome of his project, well… except for the Apple mouse. He says that has got to go! 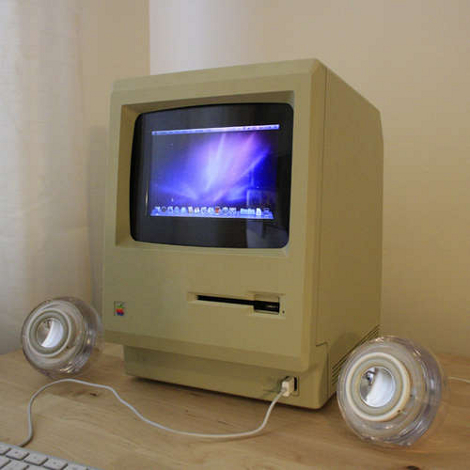 [Jake Howe] brought his 1984 Mac up-to-date by cramming new guts inside of the classic case. The goal from the start was to run OS X Snow Leopard on the machine without altering the externals. He heated and formed acrylic around the original CRT screen to make a bezel for the replacement LCD screen. The floppy drive slot was used to hide an SD card slot and USB port. The original serial port openings were even outfitted with their own USB ports. In the end he did a brilliant job of hiding the Hackintosh mini-ITX board and components inside this iconic enclosure. This is a “why didn’t I think of that?” idea. [Alec] needed a way to connect an IDE DVD drive using USB. Rather than order a connector he pulled the circuit board out of an old USB hard drive enclosure and connected to his DVD drive. Bang, recognized and running. This will prove extremely handy if you have a netbook without an optical drive. We’ve used Unetbootin to move Linux ISO images to a thumb drive in the past. In addition to getting around the lack of an optical drive, this saves burning the data to a piece of plastic. But, you should be able to use this with a Leopard retail DVD instead of a 16GB thumb drive for a Hackintosh conversion. That means you could install Leopard on a netbook without needing a Mac to transfer the disk image to your thumb drive first. [Vikash] was having trouble using his netbook in the dark so he added a keyboard light. He’s got a Dell Vostro A90 which is the same hardware as the popular Dell Mini 9. We agree that the condensed keyboard layout makes it hard to type without looking; just try to find the quotation mark, brackets, and tilde keys! He added an LED to the bezel around the LCD screen in order to shed light on the situation. Now the LED can be turned on using CTRL. An ATtiny13 microcontroller monitors pins 1 and 11 of the keyboard, waiting for the CTRL keypress, then turns on the light when it receives it. This hardware solution means it doesn’t matter if you’re running a Hackintosh (like he is), Ubuntu (like we are), or that other OS. Yet another netbook can now run OS X. This one happens to be the Samsung n310, making it our first published non-Dell netbook to accomplish the feat. The key lies in a custom (and downloadable) .ISO for intalling said operating system onto a netbook. Full instructions for the task, and an audio driver for the n310 in OS X, are available on the [ComputerSolutions] website. Oddly enough, the platform swap probably ‘freed up’ some space.